It’s Summmmmer! If you live in Toronto like I do, for some reason it means lots of rainy days. But for you lucky folk who see that thing called the sun and do all of the fun Summer things like have a BBQ. It can be hard to stay healthy at a BBQ, you can ditch the bun on your burger, but there’s always going to be tempting sides that get to you. For my lovely American readers you have an abundance of 4th of July BBQs to attend this weekend too. 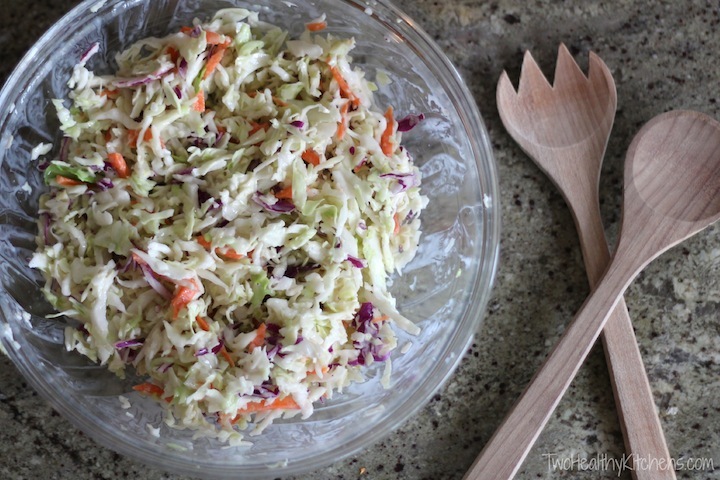 Coleslaw is a prime example, of a tempting/fatty side found at food functions; it’s creamy, delicious and since it’s made with cabbage I often pretend it’s healthy despite it being 90 percent mayonnaise. There are ways around this though: YOGURT. You can replace the mayo with yogurt as a healthy alternative! Specifically Greek yogurt! Full fat Greek yogurt provides the same creamy consistency as mayonnaise, but you avoid the danger of eating hydrogenated oils, which are an ingredient in many commercial mayonnaises. (And fat is not bad for you, it’s the sugar and hydrogenated oil you need to look out for). Mix contents into a bowl, enjoy at a BBQ where you try to avoid your neighbour who saw you take a walk of shame the other morning, or anywhere at all really. Stay tuned every week for all new #FitnessFriday posts!